Alright, I'm finally freaking over this game! What was I even so wrapped up in it for? I'll casually go back to finish Shizune's route eventually and then do the Lilly and Hanako ones, maybe read the bonus Miki routes, and once that's done I could even go back to that fanfic I put on hold to get some keks from me chums down on the forums, but I mean I can take my time with that and... what's this? The daily Google Doodle features a girl with prosthetic running legs and what is a ponytail but looks to me like a single twin tail blowing in the wind behind her? Hey, that reminds me of!... goddammit. SpunkySix wrote: Alright, I'm finally freaking over this game! What was I even so wrapped up in it for? I'll casually go back to finish Shizune's route eventually and then do the Lilly and Hanako ones, maybe read the bonus Miki routes, and once that's done I could even go back to that fanfic I put on hold to get some keks from me chums down on the forums, but I mean I can take my time with that and... what's this? The daily Google Doodle features a girl with prosthetic running legs and what is a ponytail but looks to me like a single twin tail blowing in the wind behind her? Even without that, it's for the Paralympics, a subject that is probably going to remind a lot of us of Emi. My man Brythain's still on point, I see. Nostalgia? Totally. I haven't been here in... 2 years? Maybe? Anyway, it's good to see some old faces. Lianam wrote: Nostalgia? Totally. I haven't been here in... 2 years? Maybe? Was this place more active a few years back from now? There used to be a lot more discussion about KS on imageboards and stuff when there was still lots of development going. It seems people have mostly forgotten it by now, which is kind of a shame. And welcome back, even if I wasn't around to meet you. I remember after finishing it I had so many hopes to improve myself and find happiness and all that standard stuff. Seeing the stories of other people who loved it and changed themselves really gave me a happy feeling back then. I wanted to be like those guys. 4 years later all that has fallen through, which gives me a kind of bitter nostalgia. I love the game for the good times it gave me back then, but it is no doubt a reminder that they're gone and I didn't make the most of it. A few times a year I seem to get a kinda dulled down desire to play it and recapture that optimism for the future it gave me again. Something that I do still love is that you'll be browsing xyz website and suddenly see a picture of one of the girls. It's kinda silly but seeing KS sprinkled here and there is really nice, it feels like seeing an old comrade or something. Also when one of the soundtrack comes on shuffle and you momentarily slip back into opening the tea room door for the first time to see Lilly with concord starting, or some other such equivalent. 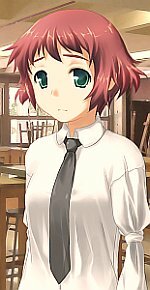 It's almost funny, but the thing from Katawa shoujo that has stuck with me the most is actually from the Scissorlips Suzu story. Any time that I think of the line “Seiji. I'm tired.” I instantly get a really entrenched wistful feeling. I remember that I basically just sat on my bed at like 1am after that ending. This post is super depressing reading it back so sorry about that. I kinda know the feeling. Just finishing playing it for a second time, the first being when it came out. But now that I'm winding down, I feel just... empty, and more than a little bitter. Maybe a little angry? This game has helped me through two incredibly low points in my life, but every play just leaves me feeling like I want more. It's an extremely bitter nostalgia. Ploggs wrote: Was this place more active a few years back from now? New people would show up nearly every day (literally) to comment in the "thank you 4LS" or the "feels bazaar" threads just to add their own wall of text detailing how much this VN touched them, and each such wall of text was itself merely a brick in the wall of walls of text (a WALLCEPTION, one might say sorry). That's how I first joined the forum, too, of course - I was going through a tough time and this VN was basically the most amazing thing in the world for me during this period X'D It became the thing I look forward to in the end of every hard week; the thing I do during my safe, private moments in which I was allowed to take a break from life... and the first time I came here was to say thank you to anyone who'd hear it, basically. There was also this huuuuuuuuuuuuuge favourite artworks thread with tons of stuff in it that was accidentally deleted at some point (and now has a succeeding thread which also grew to be pretty damn big). I used to read it all the way from the first page and some bits of it were so funny my stomach would literally hurt due to too much laughter. There were/are a bunch of other such long-running threads that I'd make sure to check every day and although I wasn't as bold as some other members here (and nobody probably knows or remembers me at this point), I loved the community. I really miss the old community. We had some many great posters that just faded away and these days the forums can go for days without anybody commenting on anything. Oddball wrote: I really miss the old community. We had some many great posters that just faded away and these days the forums can go for days without anybody commenting on anything. Yeah. Ignoring the pinned topics, I only had to count eight topics down before reaching a thread that hasn't been posted in for more than a month. Funny thing is, the Shimmie still seems to be pretty active. Pictures still being uploaded and commented on regularly. Yeah KS fan art is on the uptick. Always a nice thing.